He’s hoping to emulate his famous father’s career after signing to Arsenal’s Under 16 squad. And aspiring footballer Brooklyn Beckham was reminiscent of a young David Beckham as he shared the first image of himself dressed in his official kit on Wednesday. 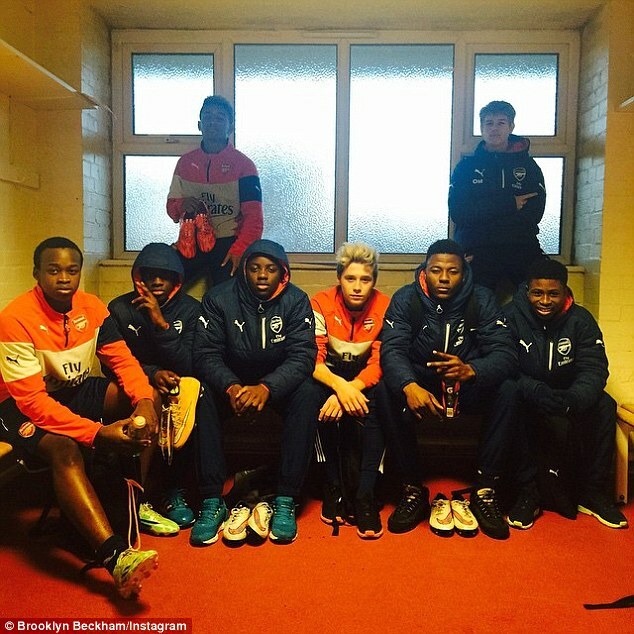 The 15-year-old hopeful can be seen sitting on a changing room bench alongside his teammates in the Instagram snap, which he simply captioned, ‘Squad’. The teen, who previously had trials with Chelsea, Fulham, Manchester United and Queens Parks Rangers, was first reported to have signed a short-term deal with Barclays Premier League club Arsenal back in November. David and Victoria Beckham’s eldest son was said to have impressed several of the clubs, but decided to go with Arsenal. Despite David’s history at Old Trafford, the Beckham family have strong connections with the club. The former Real Madrid midfielder’s youngest son Cruz, nine, is a member of the Under-10 side while Romeo, 12, plays for Arsenal’s Under-13s. Meanwhile, Brooklyn has been giving fans unprecedented access to his life since joining Instagram last November. Next article ‘I want whatever she wants’: Kanye West reveals he and Kim Kardashian are keen for more children.